Be it a long trip, a picnic or any outdoor activity, keep your beverages nice and cold with the Stainless Steel Igloo Cooler. 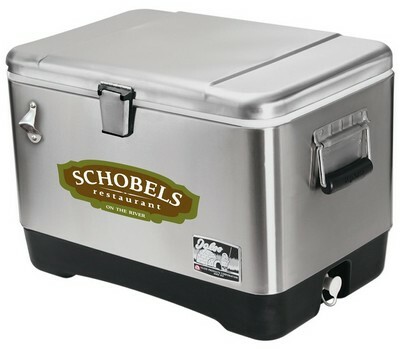 Its body and lid are constructed of durable, rush resistant stainless steel and feature Ultratherm foam insulation to keep the contents cold. Its elevated non-metallic base uses cooler riser technology that provides quick access to the beverages. The stainless steel swing-up side handles offer comfortable grip while the triple-snap, leak-resistant, drain plug allows for easy draining of melted ice. There is a convenient bottle opener located on the front of the cooler to effortlessly crack open a cold one. Emblazon your company’s logo on the cooler using full color decal imprint to make the best first impression for your brand.